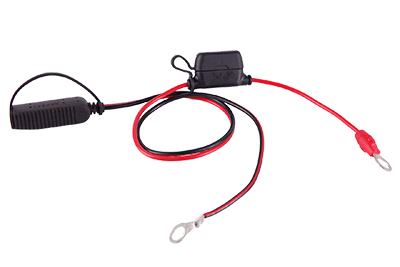 When using a connecting cable to ensure the safety of the application equipment, we usually add an on-line molded fuse holder to the cable harness, which not only ensures the stability of the equipment but also the safety of the person. The fuse holder operates from 3A to 30A and can be customized for different applications. A part of molded fuse holders has the water, fire, high temperature resistant and other performance characteristics (according to the different material and shape). The battery cable is used to power your electrical system , the cable gauge for conductive cables unit in AWG. Our cable is made in China, but conforms to UL standard, so you can use it safely. The size of the battery cable must be selected to meet the requirements of your equipments. Less conductors a cable can cause excessive heat, which can cause danger. The cable size depends on two things: the amps you need and the length of the cable, because these two factors are directly related to the size of the resistors. Our battery cables can be customized and RoHS compliant. The cable end can be crimping battery terminals or electrical cable connector and sockets. QL-Custom company OEM & ODM different series battery cables for aircraft models and other vehicle batteries. Give you a Quote in 12 working hours. Help you to design your cables. Custom made mold tooling service. Build Cable and connective drawings.